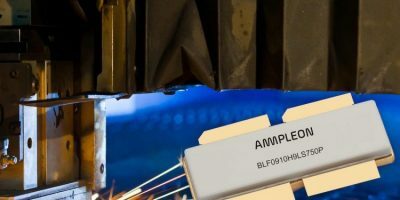 Suitable for use in industrial, scientific and medical (ISM) systems, the BLF0910H9LS750P is a high-efficiency 750W RF power transistor from Ampleon. The 915MHz enables more compact power amplifier designs, says the company. It is claimed to have a best-in-class efficiency of 72.5 per cent at 915MHz. The rugged design makes it suitable for industrial and professional RF energy applications, adds the company. The device operates at frequencies from 902 to 928MHz and minimises the amount of energy it uses to deliver a given output power. This reduces operating costs, decreases heat dissipation for simpler and less expensive cooling as well as more compact systems and lower manufacturing costs. The BLF0910H9LS750P can withstand a load mismatch equivalent to a voltage standing wave ratio (VSWR) of 10:1, through all phases. This enables users to simplify system designs to reduce the end product’s bill of materials and improve overall manufacturing yield, says Ampleon. The pre-matched input makes integration easier into end applications and broadband capabilities enable better control in operation, continues the company. The BLF0910H9LS750P is built on Ampleon’s Gen9HV 50V process. It is available now, from Ampleon and its distributors. Ampleon was created in 2015, and focuses in data and energy transfer in RF. Its portfolio consists of products for a range of applications, such as mobile broadband infrastructure, radio and TV broadcasting, CO2 lasers and plasma, MRI, particle accelerators, radar and air-traffic control, non-cellular communications, RF cooking and defrosting, RF heating and plasma lighting. Ampleon has more than 1,350 employees worldwide.